In the past, I have always had a period of time in between shows. I’ve never been this busy with shows. Ever. Well, these last few months have been so tied together that I haven’t had any time to mourn the finale of not only “Promises” but also “Knickers.” Once “Sugar” gets dissolved on Easter Sunday, I have several weeks before I begin working on “9-5” that I am dreading because it’s gonna hit me all at once. The sadness of knowing that there are some people you may never get the chance to work with again. That feeling of “it’s okay if you are totally bonkers, we like you anyway” gets pushed aside for the real world that frowns on anything other than the social norms. Some of your inside jokes won’t get shared anymore. And some of those amazing people won’t be there with hugs or smiles or laughs or all three when you’ve had a bad day. And speaking of bad days, there is no place for you to run away to for just a few hours to forget that day so you can think about it with a clearer head later on. I’ve become friends with at least 60 new people over these last few months and I’ve had the chance to reconnect with at least 20 more. In the age of social media, there is nothing better than meeting wonderful people in person rather than on a website. I find there is something so invaluable when it comes to that personal interaction because it lightly ties you emotionally together through memory. And I feel so blessed and grateful for meeting every single one of them. I am honored that I get to call them Friends. Be well and do good, friends. With “Sugar” now officially open, I have this slight sense of sorrow. Last night, when I got home from the theatre, I kept walking to random parts of the apartment. I had no idea what to do with myself. For the rest of the night the only thing that ran through my head was: What do I do now? My friends and I am sure my job would say take a break. But my head and my heart are saying FIND SOMETHING!! No, it’s more like they are screaming it! It’s been a blast just letting loose and throwing every idea I have in this last role. It’s like I’ve been given free reign to do anything that I can think of (within character, of course) to bring life to my version of Daphne. But now that the rehearsal period is over, I don’t have a new persona to “create” and I am feeling a little saddened by this. Finding my good boy cop for “Nana’s Naughty Knickers” and my inner lecher for “Promises, Promises” and my cocky masculinity that turns to kind-hearted lady for “Sugar” let me explore my brain and feelings. It was like exercise for those things. The things that get missed because they aren’t used the same way our bodies are for dancing or brains for doing crossword puzzles. I got to play pretend on my quiet by myself times and I saw such great things. That is all thanks to the scenarios I got to play with in my head. I had to think and feel things like what’s it like to be swept off your feet by someone you just met? Or how do you break the news you need to break without hurting anyone? Or how do you feel happy for your friend that’s happy but jealous and upset with your best friend for that same reason? All of these from a female and a male perspective. I hope that some of it comes through in this show and I don’t know for sure if it does because everything is so gosh darn funny. Oh, yeah, did I mention that this show is FUNNY!!! So ya gotta keep on top of that too! And I think that’s what made these last six months so incredible… it kept me on my toes emotionally and mentally. Now I have this fear; what if it doesn’t happen again? 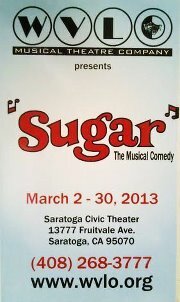 I hope you get the chance to see “Sugar” which is “Some Like It Hot” in musical form. You can get tickets at WVLO.org or by calling 408-268-3777 and leaving a message on the voicemail. It allows you to actually pic the best seats available this way. In the meantime, since I have some to spare, I will be out and about looking for mischief and updating the blog a lot more. Thanks for your patience during these busy but SO INCREDIBLY AWESOME few months. On Thursday, I finally watched The Hobbit: An Unexpected Journey. It was so breathtaking! I loved the breadth of locations and the transitions from scene to scene. While the character development was brief but adequate, I am hoping that the sequels will have more info on the backstory of each of the charming characters. I really wanted more of Radagan the Brown and his rabbit sleigh. I WANT A RABBIT SLEIGH!!!! AND A HEDGEHOG!!! Four big ol’ smiling faces! Hooray!! As I mentioned, the movie made me want to do two things. First, it made me want to take an unexpected journey of my own. It made me want to travel to somewhere, anywhere and see new things and meet new people. I think that may be why I love to try new things. I began thinking “shoot, I have almost a week off maybe I should try to take a trip somewhere.” Then the reality that my car may not make it kicks in and squelches that idea. At the beginning of the year, I got to be the MC for NotBlueAtAll.com‘s A Fatty Affair. It was a blast. I loved being a part of something that is encouraging and positive. I loved it so much that I am gonna do it again come January! And you are all invited! Its a self accepting event where there are no judgements, just each of us enjoying the beauty that is you as you are and empowering you to believe it. Then, feeling great from the Fatty Affair gig, I thought I would try my luck with an audition for San Jose Stage Company. It was one of the few auditions that I really felt pretty good about an audition. I believe I may be getting the hang of this. YAY!! I didn’t get in and I wasn’t expecting to since many of the people they use are Equity. Next, I was really focused on more dancing and I loved it. I got to perform a piece choreographed by one my teachers, Daynee, in various incarnations. At one point, I thought it was going to be a solo since it started out as a quartet then went down to a trio with different people. Then, we were asked to try it as a duet, but then we couldn’t nail down a rehearsal time, so it was nixed. It was great to perform it during National Dance week in Santana Row and at Western Ballet’s dance show as well as Zohar’s own dance performance. It was there that I met Walter Mayes for the first time. Actually let me reword that. I knew who he was and I’ve seen him before, and he kinda scared me. You see, the first time that I was actually in the same room as him, he was physically throwing this little guy out of a house. Imagine seeing this 7 foot man (if not that then very nearly) picking up this little 5 and a half foot guy and carrying him to the door. He had this booming voice, and I thought to myself, “I am just gonna stand over here and stay out of his way.” So when he came up to me after the dance concert, I didn’t know what to do. He asked me to audition for Promises, Promises in the middle of the year. I told him that I didn’t think I was going to and I gave him my reasons, but he insisted that I audition anyway. Eventually I caved. It would be a good learning experience to work with a new director. Auditions came, I flubbed it and I secretly was hoping to be done with it. But somehow, Walter offered me another shot during callbacks and I landed the role of Mr. Kirkeby. So I had to wait until the end of the year to begin rehearsals (which are going on now). While I was waiting for rehearsals to begin, I began to feel a little braver thanks to the conversation with Mr. Mayes. So I auditioned for a brand spanking new musical about the buddha, but this time it was a woman. I travelled to San Francisco and was there for a hot minute, and came back home with an appointment the next week for audition #2! That was exciting. Sadly, that was as far as I got in the process. Not to worry, I didn’t fit any of the physical character breakdowns so I knew that it was ending soon. But that little try helped me to see that auditioning wouldn’t kill me or maim me in any way, so my intense fears were completely pointless. Feeling bolder, I auditioned for the national tour of Green Day’s American Idiot. It was just like any other audition. I wasn’t sure what to expect and I think I was building it up way too much in my head. I didn’t screw it up, but I don’t think I was flawless either. hahahahaha. Live and learn, right? Again, I was a face your fear situation and I walked away the winner of that battle. Then the audition well, dried up for a month or two. So I was twiddling about with nothing but my 9-5 to keep me busy. One day in my inbox, I got a notice for Santa Clara Players, a company I have never worked with. I considered auditioning, but I never heard of the show, nor did I like the title of it. So I trashed it and paid it no mind. Things continued like normal until the day of auditions. I did all my usual errands and went to visit my family. Then on the way home, I was literally on my street, I decided to give it a shot. I first got lost trying to find this place but once I did I couldn’t turn back. So I walked in completely cold and performed a monologue I’ve had in my back pocket since high school but stopped using. It got me my first leading man gig! Of course he was like the 4th important character, but finally I had this type of role. I cannot tell you how much of a booster that was. During the middle of the rehearsals, I got an email from a friend to participate in a read though of his scripts so he can tweak and adjust them and address any questions that could possibly come up. I have a draft of the post that was supposed to go up, but I didn’t finish it. I will work on that tonight! That was the first time I’ve ever been invited to give input on a script that’s just been written. I mean I’ve done it for AMT when I worked there, but that was because I didn’t have anything else to do. Someone asked me, as an actor, to do this, so I was shocked. So as I am performing in Nana’s Naughty Knickers, rehearsals begin for Promises, Promises. I didn’t know what to expect when I got there so I kind of kept quiet and watched the people for the first week. Now having gotten to know many of them, I have to say, they are a fabulous bunch of people. Some I’ve worked with before, and some I am meeting for the first time. But all are so helpful and friendly. Then to make the process even more painless, the staff is awesome. Mr. Mayes is such a positive and detail oriented director that it makes you want to work that much harder for him. Lee Ann Payne our choreographer has made some adorable numbers, hard as all get out, but adorable. Dan and Anita who handle the music and vocals respectively are so helpful. This staff has been described as the “dream team” and I have to admit they may be right. I am having a lot of fun so far and I can’t wait til this show gets put on it’s feet at the end of January. You can purchase tickets HERE! So get’em cuz we may just sell out! Screw that, we WILL sell out! Then a few weeks ago, there were auditions for Sugar. I knew the movie Some Like It Hot which the show is based off of. I really wanted to participate in this show and I wanted to keep this momentum of getting to auditions and not freaking out, so I gave it a shot. Since I couldn’t possibly rehearse for two shows at the same time, I thought my chances were slim to none. I thought my song was good, the tempo was slower than I would have liked. The reading went fabulously, I felt, especially since they were laughing a lot. So I got a call back for the two leads and a character that tap dances to his death. The callback felt a bit rough, but I tried a ton of stuff even if it didn’t make sense, I wanted to push and not play it safe. We must’ve read about 6 times a piece with different partners then switching the roles. Every single time, I tried new stuff. I tried not to repeat what the other guys were doing, and I had to hope that it worked. Then I was told that since I was going to be missing the first three weeks of rehearsal, the director really had to think hard about the ramifications of offering me one of these main roles. So come the new year, I will be rehearsing two shows at the same time!! Gah!! I already began working on Sugar and the script is so funny and I feel so blessed and grateful that the director trusts me enough to do this. But to be safe I have an understudy, Ian Douglas, who is a great performer. Talk about pressure!! So I look forward to seeing where this newly found “bravery” takes me. Its time to plan for next year. And I am planning bigger and hopefully better!! Onward and upward, my friends!! I hope that you too take a look back on your 2012 and see the unexpected journey you have taken. Have things turned out as you hoped? Have you learned something new about yourself? Leave a message below. Well, this afternoon’s matinee audience for Santa Clara Players’ “Nana’s Naughty Knickers” was awesome. People were quite lively which is new to me for a Sunday crowd. Well except for when I was in White Christmas two years ago. SO let me reword that. A lively Sunday crowd was…unexpected!! But definitely appreciated!! Their laughter made the show move to a whole new level of energy and fun! So hat’s off to them for bringing the party! 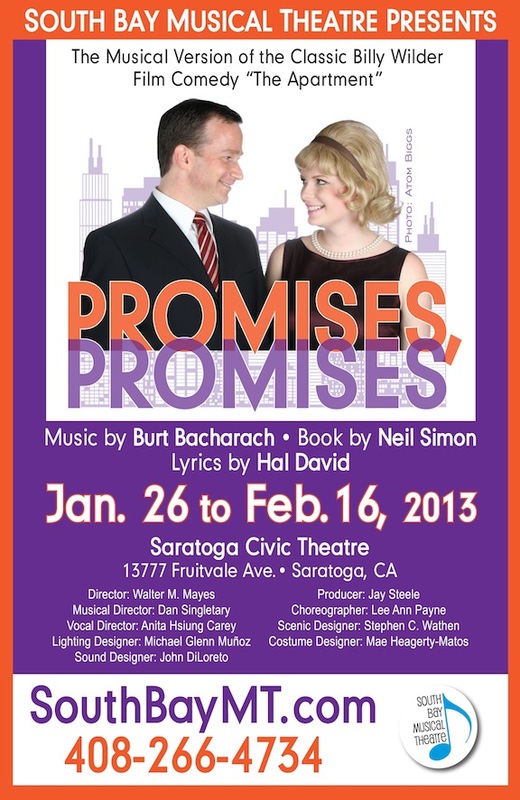 Tonight starts the rehearsal process for SBMT’s Promises, Promises!!! I like the movie a lot and the music is good, but the real reason I want to do this show is to work with the director and choreographer…FINALLY!!!! I’ve been trying for years, and things just never seemed to line up properly. The novel is coming along. It’s moving at a snails pace, but it’s moving. I shall keep you posted! Awesome little treat. I PROMISE…. As you know, or don’t know, the revival cast recording of Promises, Promises hits store shelves TODAY! If you don’t want to leave the comfort of your own home, iTunes is selling it for $10.99. I can’t do that for a cast recording unless it is awful. I love having the liner notes and all that jazz. Amazon posted this incredible link about the recording of Promises, Promises that features Kristin Chenoweth and Sean Hayes. See it HERE. Enjoy.